There’s a lot to see & do at Walt Disney World, right? Well there is even more during the holidays! This festive time of year is my favorite. The resort is decorated so beautifully, festivities abound, & everyone just seems a little more merry. If you are planning a trip for this time of year, here are some resort offerings to incorporate into your itinerary. 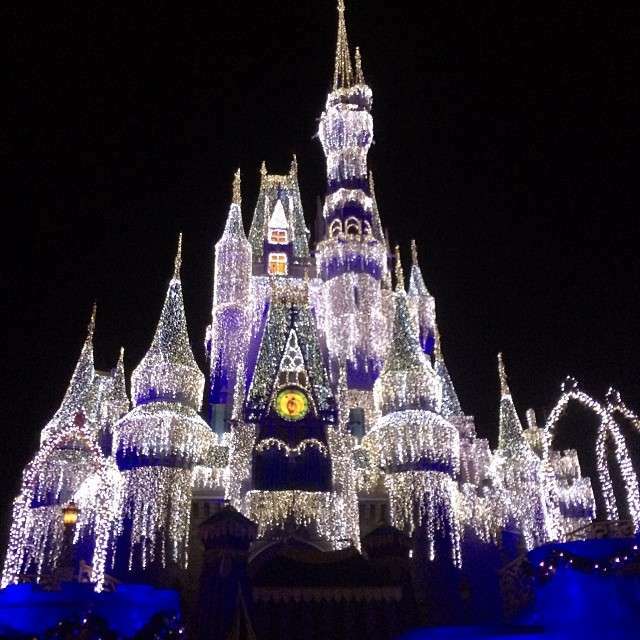 Magic Kingdom – Every evening, Cinderella Castle is lit so that it glitters & twinkles just like Cinderella’s slippers. It is really very beautiful & a wonderful photograph. On select dates in November & December, Mickey’s Very Merry Christmas party is held. This is a separately ticketed event with its own special parade, dance parties, stage shows, meet & greets, & free hot chocolate & cookies. During the week of Christmas, the afternoon parade is replaced with the party parade. Hollywood Studios – The Osborne Family Spectacle of Dancing Lights can be found in the Streets of America. This is a light display like you have never seen before! There are millions of lights creating a dazzling display all set to holiday music. Wear your glow with the show ears to become a part of the show yourself. It is, quite literally, a spectacle to behold! EPCOT – Near the fountain, guests can listen to Joyful! A Gospel Celebration of the Season. These talented singers will surely get you into the holiday spirit. In the Land pavilion, guests can view a gingerbread village made up of icons from Disney resorts from around the globe. In World Showcase, the Holiday Storytellers can be found. Every country has a storyteller to inform guests of holiday traditions from their country in their own creative way. The America Pavilion is home to the Voices of Liberty who are amazing every day of the year, but even more so during the holidays. The group dresses in Dickens style costumes & sings a special selection of traditional tunes. Guests can tell Santa their wishes at a meet & greet opportunity. My favorite holiday event is the Candlelight Processional. A celebrity guest narrates the Christmas story with the help of a very large mass choir, live orchestra, & even herald trumpets! Downtown Disney – Festival of the Seasons calls Downtown Disney home. This festival features a meet & greet with Santa & live music groups. The Marketplace has a display of trees, lights, & decorated store windows. Carolers & variety acts can also be found on the streets. Resorts – You should plan some time to explore the resorts as there are some true pieces of art displayed. In addition to massive, beautiful trees & decorations, some resorts also have additional unique displays. At the Grand Floridian guests will find a life-sized real gingerbread house. The Contemporary has a huge tree made of gingerbread. The Beach resort has a carousel made of gingerbread & chocolate. There are also many chocolate sculptures around it. The Boardwalk resort has a smaller version of a life-sized gingerbread house. The Yacht Club resort has an edible toy train display. Fort Wilderness resort offers sleigh rides & the campground has a wonderful golf cart parade. You should also take a tour of the campground at night to see some amazing displays by the campers! The Swan & Dolphin resort has some wonderful gingerbread houses throughout the resort as well as an amazing chocolate sculpture feature life-sized elements. You will also find Ms. Claus & her elves giving away egg nog & inviting the kids outside to meet Santa, who arrives in a decorated golf cart in his vacation attire of shorts & flip flops. See the pics below for some images of last year’s celebrations! And now that I’m in the Christmas spirit, I think I will turn on my CD of the Candlelight Processional. Happy planning everyone! !